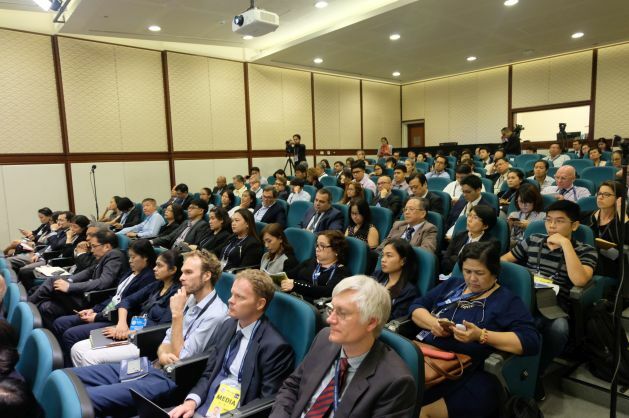 Seoul, May 4 2018 - The Global Green Growth Institute (GGGI) hosted a side event under the theme of “Green Growth and Regional Cooperation” on 4 May on the sidelines of the 51st Annual Meeting of the Asian Development Bank (ADB) in Manila, Philippines. The GGGI side event served as a platform for discussing opportunities and challenges in mainstreaming green growth, such as enabling policies to mobilize green investments, addressing poverty and ensuring sustainability while promoting economic cooperation among countries in the context of regional cooperation, for example, along the proposed Belt and Road route. 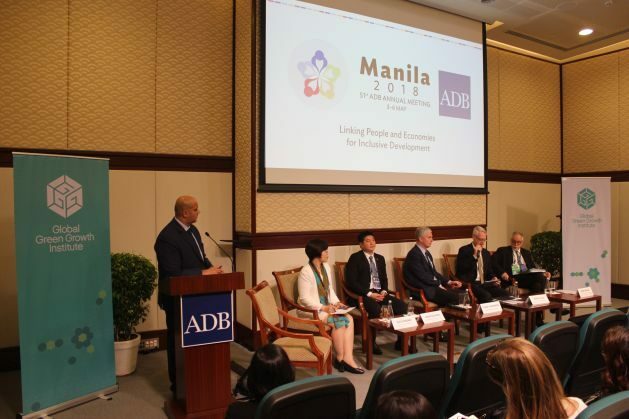 The topic of green growth and regional cooperation is closely in line with the ADB Annual Meeting’s theme of Linking People and Economies for Inclusive Development. The Belt and Road Forum was launched in May 2016 in Beijing, China. It aims to invest USD150 billion in the next five years to support projects that will help address significant regional infrastructure gaps in agriculture, water management, electric power, communications, and transport of the countries along the BRI route. “The meeting is a great opportunity for GGGI to share knowledge and lessons we have acquired through engagement with our member and partner countries over the years,” says GGGI Director General, Frank Rijsberman. “Our goal is to examine opportunities and explore ways to address the mainstreaming of green growth through the Belt and Road Initiative”. During her presentation, Ms. Guo Dongmei, China ASEAN SCO Center for Environmental Cooperation said that China will launch a Coalition for Greening the Belt and Road Initiative. They will examine and explore ways to decarbonize $300 billion of Chinese investments in 70 developing countries. The event covered policies in greening the Belt and Road Initiative in a presentation by Ms. Guo Dongmei, China Association of Southeast Asian Nations Shanghai Cooperation Organisation (ASEAN SCO) Centre for Environmental Cooperation. She also presented strategies to support the acceleration of green investment and technology deployment along the Belt and Road. Mr. Winston Chow, GGGI Country Representative for China also elaborated on the importance of Greening the Belt and Road Initiative (BRI) and said that GGGI supports this commitment to align the objectives of the Initiative with the development goals of the 2030 Agenda for Sustainable Development. The side event provided an opportunity for the participants to better understand how mainstreaming green growth can contribute to poverty alleviation, which is in line with the Sustainable Development Goals (SDGs). The environmental impacts and social dimensions of the BRI, mobilizing private sector participation, and Belt and Road countries’ national demand on green investment, were examined in a panel discussion. Around 200 participants, including finance development ministry representatives, policy makers, investors, development partners, scholars, media, academia and civil society participated in the GGGI side event. The GGGI event officially opened with remarks by ADB Senior Advisor to the President, Mr. Ayumi Konishi. According to the 2017 ADB report, Meeting Asia’s Infrastructure Needs, developing Asia will need to invest USD 1.7 trillion per year for the region to maintain its growth momentum, eradicate poverty, and respond to climate change. Based in Seoul, GGGI is an intergovernmental organization that supports developing country governments transition to a model of economic growth that is environmentally sustainable and socially inclusive. GGGI delivers programs in 27 partner countries with technical support, capacity building, policy planning & implementation, and by helping to build a pipeline of bankable green investment projects. More on GGGI’s events, projects and publications can be found on www.gggi.org. You can also follow GGGI on Twitter and join us on Facebook, YouTube and LinkedIn.